Meltem Güney, a 29-year old history teacher, has been put in pre-trial detention over alleged membership to Turkey’s Gülen group, accused of masterminding a coup attempt on July 15, 2016. 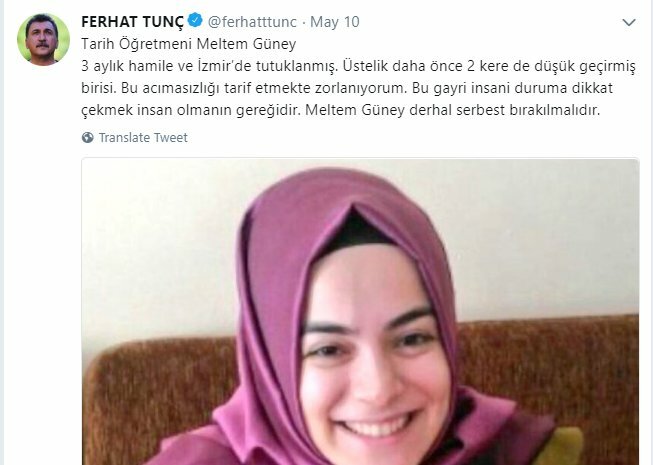 According to Ferhat Tunç, one of Turkey’s most renowned human rights activists, tweeted on May 10 that Güney is 3 month-pregnant and had suffered miscarriage two times in the past. Turkey survived a military coup attempt on July 15, 2016 that killed 249 people. Following the putsch, the Justice and Development Party (AKP) government along with President Recep Tayyip Erdoğan pinned the blame on the Gülen movement, initiating a widespread purge aimed at cleansing members of the movement from within state institutions, dehumanizing its popular figures and putting them in custody.